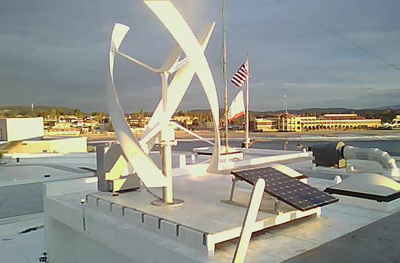 UCSC's renewable energy microgrid project on the Santa Cruz wharf includes a wind turbine and solar panels. A similar microgrid will be established at Hartnell College. The National Science Foundation (NSF) has awarded a five-year, $4.5 million grant to UC Santa Cruz to fund a cooperative research and education program on renewable energy involving universities in the United States and Denmark. The project addresses the technical, social, and economic aspects of community-scale renewable-energy microgrids. "The issues of how to integrate renewable energy sources like wind and solar power with the existing electrical grid have not been fully explored. It's not just a technical problem, because the technical issues are coupled with the economics and sociology of how people use energy," said principal investigator Michael Isaacson, the Kapany Professor of electrical engineering in the Baskin School of Engineering at UC Santa Cruz. In addition to UC Santa Cruz, the primary partners in the program are UC Davis and two Danish institutions, Aalborg University and the Technical University of Denmark. Faculty at these institutions have worked together for several years on a renewable energy summer program that brought together U.S. and Danish students for hands-on, project-based learning in both countries. The new grant allows a significant expansion of this program. "This grant is truly funding the energy of our future," said Congressman Sam Farr (D-Carmel). "In order for these microgrids to work, they must meet different needs for the communities they intend to serve. I am proud that the members of the UCSC program are taking this into account as they work with their Danish peers to create new forms of practical and renewable energy." The core research efforts focus on integrating engineering design and deployment principles with sociological and behavioral aspects of energy use. The interdisciplinary research team includes faculty with a wide range of expertise, including experts in electrical engineering, computer engineering, politics, sociology, environmental studies, energy technology, chemical and materials engineering, and technology management. "Each institution brings their own expertise, and we've been working together for several years," said Isaacson, who directs the Center for Sustainable Energy and Power Systems (CenSEPS) at UCSC. "The Danes are ahead of us in some aspects of renewable energy, especially with wind power, which they are implementing on a large scale. In this project, we want to look at small-scale renewable-energy microgrids that can serve a local community or transfer power back to the main grid." UC Santa Cruz has several renewable energy microgrid projects in different stages of planning and implementation, including the Green Wharf Coastal Energy Research Facility at the Santa Cruz Municipal Wharf and additional facilities planned for Hartnell College in Salinas and the Watsonville Water Resources Center. At UC Davis, the West Village Community Development is a mixed-use neighborhood project designed to use energy efficiency and renewable energy to achieve "zero net energy." These and other facilities in California and Denmark will be used as test beds for studying the technical and social aspects of small-scale microgrid systems. Technical challenges include the intermittent nature of renewable energy sources such as wind and solar, and the need to match energy supply with variable demand. How to optimize a small-scale microgrid for local conditions and integrate it with the main power grid is a major focus of the project. Researchers will also investigate social and policy aspects of energy consumption and the willingness of communities to accept local development of renewable energy sources. "We don't want to develop technologies that will not have community acceptance," Isaacson explained. At UCSC, for example, he will be working with Ronnie Lipschutz, professor of politics and a co-principal investigator on the grant, and others to study the willingness of consumers to change energy use behaviors and practices. Integrated with the five-year research effort is a well-balanced educational program for undergraduates, graduate students, and professional development. The program will focus on sustainability engineering, renewable energy, and ecological design, and will include workforce development seminars for energy industry professionals. Participating faculty have already experimented with the use of videoconferencing systems to give students access to faculty at different institutions. Isaacson said they plan to develop jointly taught courses between UCSC and Denmark using advanced videoconferencing technology. The program will also continue the California-Denmark Summer School in renewable energy that has been conducted for four years, alternating between the two countries. "This program allows us to significantly scale up what we've been doing on an ad hoc basis and get other institutions involved," Isaacson said. "Everyone knows we've got to be able to change the way we generate and use energy. Our emphasis is on community-scale microgrids, focusing on system optimization."